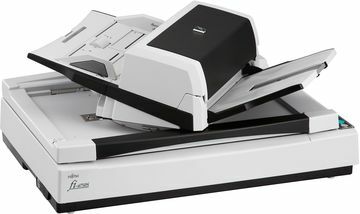 Compact, multifunctional A3 simplex flatbed scanner with an attractive price-performance ratio, the fi-6750S is suited for continuous batch scanning using the 200-sheet ADF, whilst the A3 flatbed allows bound or fragile documents to be scanned. Our most affordable A3 ADF and flatbed production scanner, the fi-6750S, scans batches of up to 200 sheets in black-and-white and colour at 72ppm in A4 landscape. The rotatable ADF which is positioned on top of the flatbed unit can be locked at the centre or moved to the left, and the ADF direction can be adjusted to the operators’ individual needs. This feature makes the fi-6750S particularly easy to use for both right and left-handed users, while its compact size makes it fit in the smallest office space. The fi-6750S comes loaded with features allowing the scanner to work autonomously as a true batch document scanner. 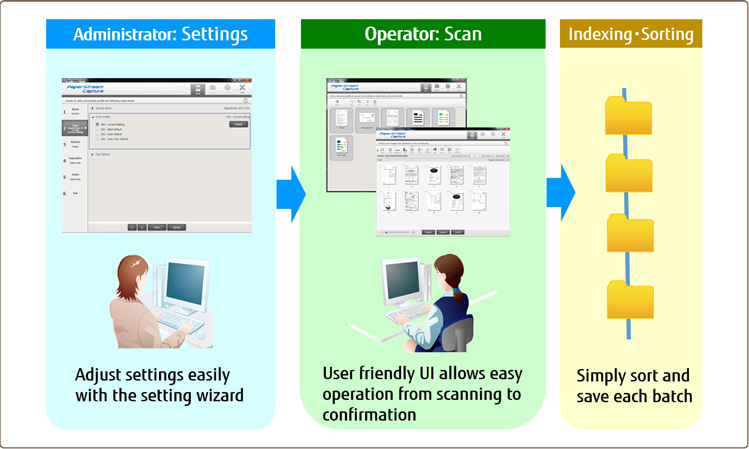 Intelligent multi-feed function simplifies pre-scanning preparation and improves efficiency by identifying documents that tend to trigger false multi-feed alerts, such as documents with photos or sticky notes attached. Additionally, continuous uninterrupted scanning is achievable due to the fact that paper is fed from the bottom of the stack allowing for more paper to added during the scanning process. The fi-6750S scans trapezoid-shaped documents across their full width, as well as ensuring that index tab and sticky note attached documents are scanned in their entirety. In addition, the fi-6750S removes the circular and angular punch hole representations that are created from scanning loose-leaf sheets, courier service forms and other similar documents. Maximum: A3(297mm x 420mm), Double letter(11in. x 17in).